Robert (Mouseman) Thompson (7 May 1876 – 8 December 1955) was a British furniture maker whose designs were both functional and very collectable. 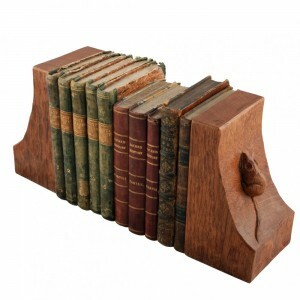 His designs with their clean, simple lines, careful workmanship, classic construction and mouse carvings have attracted and continue to attract considerable interest from collectors not only in the UK but worldwide. Pictured: A Robert Mouseman Thompson Refectory Table c1935. Sold for £2,250 at Bonhams, London, Nov 2013. 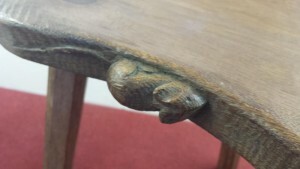 Robert Thompson lived in Kilburn, North Yorkshire, where he set up a business manufacturing oak furniture, which featured a carved mouse on almost every piece. 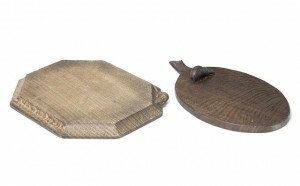 Pictured: A Mouseman Oak Cheesboard and Mouseman Breadboard, c1935. Estimate £300-£500. It is claimed that the mouse motif came about accidentally in 1919 following a conversation about “being as poor as a church mouse”, which took place between Thompson and one of his colleagues during the carving of a cornice for a screen. This chance remark led to him carving a mouse and this remained part of his work from this point onwards. 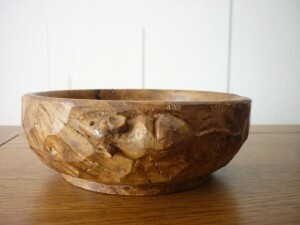 The mouse carvings can often be used to date pieces. He was part of the 1920s revival of craftsmanship, inspired by the Arts and Crafts movement led by William Morris, John Ruskin and Thomas Carlyle. More specific to furniture making in this genre and era include Stanley Webb Davies of Windermere. Early Mouseman pieces are highly desirable and unlike a great deal of Victorian and early 20th century furniture, pieces are bucking market trends and are increasing rather than decreasing. The factory still produces furniture so new pieces are available. Below are realised prices from auction rooms and online auctions. 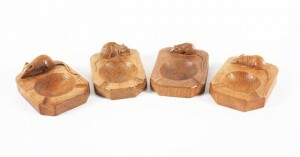 Robert Mouseman Thompson oak ashtrays. Sold for £168 at Bonhams, Knowle, June 2011. 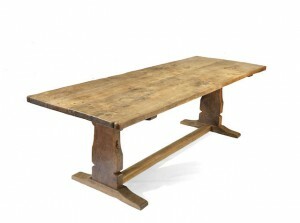 A Robert Mouseman Thompson Refectory Table c1935. Sold for £2,250 at Bonhams, London, Nov 2013. 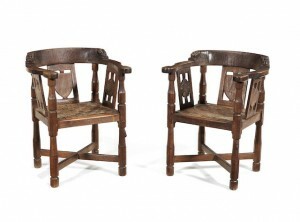 Robert Mouseman Thompson Pair of Monk’s Chairs, c1940. Sold for £7,500 at Bonhams, London, Nov 2012. Sold for £450 on ebay, April 2015. A Mouseman Oak Cheesboard and Mouseman Breadboard, c1935. Sold for £25 on ebay, April 2015.